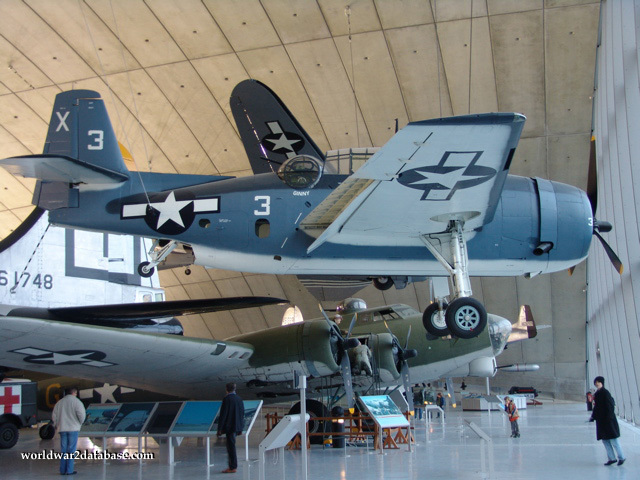 Duxford has painted this TBM-3 in the same paint scheme as George Bush's plane off of the USS San Jacinto (CVL-30) when he was shot down in 1944. Originally USN Bureau Number 69327, this aircraft served with the Royal Navy as No. 326.Behind it is "Mary Alice" B-17G painted in the markings of the 401st Bomb Group. It's actually tail number 44-83735, a B-17G-95-DL built by Douglas at their Long Beach Factory in Calfornia, but it's painted as a B-17G-35-BO with tail marking 42-31983. In case you can't read USAAF tail numbers, the actual plane was built in 1944 while it's painted to look like a plane that was built in 1942.You can also just make out the tail of the B-29A Superfortress.